Staff at the Australian Bat Clinic and Wildlife Trauma Centre have saved 130 orphaned baby bats so far in the wake of the floods that have ravaged Queensland in past weeks. Bats are among the animals of all kinds who have been in trouble in north-east Australia. 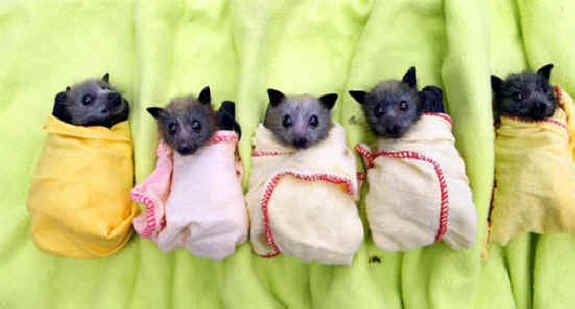 Storm season is often a challenge to bats, and the clinic saved 350 youngsters during the 2008 storm season. This year (2010), however, they think there’s more going on environmentally than just wild weather. Clinic director Trish Wemberley says her teams of caregivers have visited several bat roosts on the coast in recent weeks to find 4-week-old babies on the ground covered in maggots and fly eggs. "They’re coming down to feed on the ground," Wemberley explained. "That makes them vulnerable. It’s not a natural occurrence and shows there is trouble in the environment. Bats are a barometer to what is going on in the environment. They’re our canaries down the coal mine." The surviving youngsters are swaddled in clean dust cloths and are bottle fed and then kept either hanging on clothes lines or in special intensive care units until they are ready to fly again in about four weeks.